Carolyn Kaler's work is getting noticed all over the Crystal Coast. The gray stones and green vines start above the end of the bar, growing upward and taking the eye to a Mediterranean scene that engrosses four walls, two crisscrossing beams and a ceiling. Everyone who comes into Bistro-By-The-Sea, co-owner Libby Eaton says, is drawn to the colorful mural in the Morehead City restaurant’s atrium. It’s the first thing many customers want to see. It only makes sense, then, that the artist’s work can also be seen at Michelangelo’s. 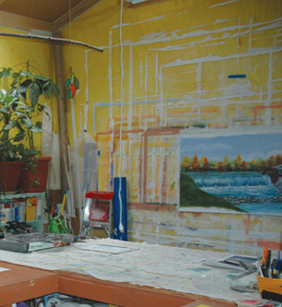 Carolyn Kaler, a versatile artist who specializes in acrylics, was commissioned by Eaton to paint the mural when the Bistro first opened at its current Arendell Street location in 1997. Kaler spent a week completing the work while she stayed in her RV in the parking lot. While the finished product has played to rave reviews, Kaler has a secret. It was an auspicious debut. Since then Kaler, who has painted since she was a child and done so professionally for the past 15 years, has been in high demand. Her work adorns the walls of several area restaurants—including several Michelangelo’s pizzarias in the area—and can be found in dozens of homes along the Crystal Coast. “I love her,” says Courtney Barnhill, who has about 10 Kaler works in her Cape Carteret home. “I think everybody should have a mural of hers in their house.” Sitting at her kitchen table at her bucolic home in Wallace and surrounded by many forms of her own work, Kaler is somewhat guarded as she talks about her life. She gives little detail about living in her native New Jersey before she moved south 35 years ago—only offering that the cold weather was tough on her horses—and she doesn’t seem terribly interested in discussing herself. But ask her about painting, and the conversation shifts into high gear. It’s clear where her passion lies. “It’s a challenge to have something in front of you and create a drawing that looks like that,” Kaler, an extremely youthful 64-year-old with a second passion for animals and a third for plants, says as she points to the table’s centerpiece as an example. “People say, ‘Hey, that’s that!’ It’s pretty cool.” Through the living room and past all sorts of decorative pieces Kaler’s done in a variety of media is her spacious studio. There, nearly finished works rest on easels or on the wall, drying in the sun that comes through the room’s skylights high overhead. The fruits of her labor of love are everywhere; a mosaic wall clock, a stained-glass butterfly, a mobile of yellow birds and a number of paintings depicting all sorts of subject matter decorate the home. The walls have textured faux finishes—another of her specialties—and some have thematic paintings on them. The interior entrance to Kaler’s studio, for example, is surrounded by tree branches that seem to be growing out of the door frame. Every nook seems to house a piece of art, every wall just the right amount of color. The house is full without being cluttered. Behind Kaler’s home, which sits on about an acre just one turn off N.C. 11, is a full garden with tomatoes, eggplants, beans and bright flowers that lend contrast to the black and white kittens hopping beneath them. A second garden with a stone walkway invites visitors to relax among green potted plants and hanging birdhouses. Inside, above the kitchen table, is a green and white detailed acrylic rendering of a magnolia blossom from Kaler’s yard, where her young kittens frolic among the eggplants. Kaler, a gentle soul who can’t pass up a hungry animal if it happens upon her busy yard, has two adult cats, five kittens, a dog and seven cockatiels, which chirp back and forth to one another in the studio. The four-legged creatures—all of them rescue animals—stay mostly outside. “They’re good,” says Kaler, explaining her affinity for her stray friends. “Animals are good for you, and they need you. I don’t know how people can live without pets. I really don’t. They’re just missing out on so much.” Kaler’s work, though, is hard to miss. Among her area projects, in addition to the Bistro’s atrium, are murals at Kathryn’s Bistro and Martini Bar and at Portofino, both in Emerald Isle. She also painted a large, detailed mural in the Bistro’s banquet room, depicting a waterside Mediterranean village. One of the most amazing aspects of Kaler’s mural work is that, despite its grand scale, it’s fully mobile. Customers can visit her website at www.themagicalbrush.net and commission Kaler to do a mural for their home or business. Once the customer’s exact desires are worked out, Kaler can complete the piece in the comfort of her home studio and ship it to the client, who can have mounted on the wall like wallpaper. 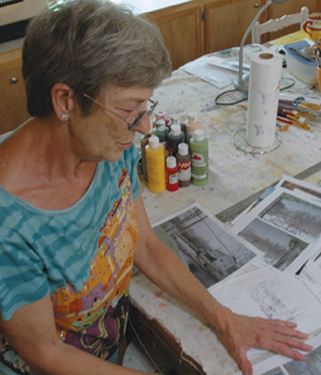 Kaler painted the port mural that hangs high above diners at Portofino from her studio. It was then hung in three pieces at the restaurant, eliminating the need for Kaler to erect scaffolding and work as the restaurant prepared to open. Much of Kaler’s work is done in private homes. Many customers have her come in for days at a time and work on faux finishes for the walls or custom-ordered paintings that are there to stay.